Is a piece of code capable of mimicking the way humans listen to music? 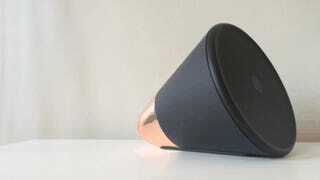 That's the promise of Cone, a "thinking" speaker that watches what you listen to and learns from it. It doesn't perfectly replicate your tastes—but it's pretty damn fun to watch it try. Cone is the first product of San Francisco's Aether Things, a crack team of designers and engineers who have put in time everywhere from Apple and Google to NASA and Nokia. At today's Re/code Code Conference, Chief Product Officer Duncan Lamb gave the speaker its first public demo, and announced that Cone will ship on June 23rd. I got an early peek at Cone back in March, but I've spent the last month hanging around with Cone in my own home. Here's what I learned; or rather, what Cone learned about me. Cone is a "thinking music player" that attempts to figure out what you like as you listen. This $400 Wi-Fi speaker is powered by Rdio for music and Stitcher for radio and podcasts, with more partners to come in the future. If it sounds like just another Pandora knock-off, it's not; Cone's real selling point is in the complex algorithm it uses to monitor what, when, and where you listen to music. Then it builds on your habits to make choosing music easier—at least in theory. Cone's designers want to solve a very specific problem with How We Listen to Music Today. Let's call it the post-radio conundrum. Streaming services like Rdio and Spotify have made it easier than ever to find, collate, and share music. Thanks to unlimited streaming services like these, you are now your own best DJ. There's just one thing missing: Ease of use. Sometimes you don't want to pick out a playlist. Sometimes you don't want to go to the trouble of setting up a wireless speaker. Sometimes, you just want something that acts like the radio of olden days, but one without ads, and one that implicitly knows what you have in mind. One that knows that your listening habits differ from the living room to the bedroom. That's the concept behind Cone. Cone is one of the most beautiful pieces of technology to come across my desk in years. It's simple without feeling cheap, eye-catching without feeling obtrusive. It has gravitas, which is a rare thing to find in consumer electronics. In the 1990s, William Gibson wrote about future computers made out of rare metals and stones. Cone looks like Gibson's vision come to life. It feels different too: The speaker packs a 3-inch subwoofer and eight hours of battery life, but it weighs about the same as a good-sized hardcover book. You can carry it in one hand, but it's larger than it looks thanks to its conical profile, which mimics an old-timey gramophone cone. The small end is capped in a smooth copper veneer that's unmarked except for a tiny Aether logo etched discretely onto one side. The design goal behind Cone, both in terms of hardware and software, is the reduction of information. So the industrial design team pared the speaker's controls down to three basic parts: the on/off switch, two tiny copper-plated volume buttons, and the wide circular face—which functions similarly to an iPod click wheel, if it was blown up to the size of your outspread hand. You control what's playing by giving the outer rim a spin, or you ask Cone for a specific song or artist by pressing a central button on its face. All that pretty hardware is designed to help Cone interpret information about your music tastes using its proprietary software, which was developed over the past two years by Aether's team of engineers. Using ideas borrowed from the 70-year-old field of machine learning, Aether's algorithm is designed to parse your listening habits into a mathematical formula that, in theory, will know what you feel like listening to before you do. That formula is based on thousands of data points pulled from how you interact with Cone. Every time you use the speaker, you're adding another data point to your own personal algorithm. If you skip a song, Cone knows not to play it again. If you turn the volume up or down, Cone takes note. Even location matters: If you prefer NPR in your kitchen every morning and Broken Bells on your deck at night, Cone records dates and locations. Using that information, it creates a kind of habitual schedule for you, all the while introducing you to music you might be interested in based on all that big data. Cone is really two things: A physical speaker and a piece of software. One is masterfully designed, the other still needs plenty of fine tuning. But first, let's talk about the real, tangible device itself. Cone arrives in a un-dyed cardboard container that looks suspiciously like an oversized jewelry box. Pop it open, and the speaker is almost immediately ready to play. To use it, you need iOS 7 or OSX Mavericks; unfortunately, support for Android users is still to come. Set-up is simple: You connect Cone to your Wi-Fi network and follow a couple of steps to install and link up the app, which is powered by Aether's launch partner, the subscription streaming service Rdio. Once you've got Cone turned on, all you need to do to hear it is give its circular face a gentle turn to the right. It will play something random—in my case it was a Top 40 pop song—and if you're not into it, turn the click wheel clockwise to change it up. If you're still not feeling it, give Cone a big, Wheel of Fortune-style spin. What comes out might surprise you: In one case, I got a children's radio show. In another, Ke$ha. Think of the big spin as Cone's version of Google's "I'm Feeling Lucky" button. Now you're probably wondering how to get Cone to play something specific. This is where the speaker's voice control comes in. At the center of its face is a small button outlined with a needle-thin LED. To request an artist or song, tap the central button and wait to hear a gentle chime accompanied by a pulsing blue light. That's your cue to ask "play Toro y Moi," or Gwar, or a Strauss tone poem, or... you get the point. Cone will process your request for a minute, and if it's successful, a green light will pulse and your jam will come on. If it's not, a red light—the universal symbol for "bummer"—will pulse and you'll need to try again. If you're not into Cone's new-fangled interaction design, there is a back door: AirPlay. You can easily stream anything from your iOS or OS X devices to the speaker. And luckily, Cone is still learning and thinking about what you stream to it from your phone or computer. Since Cone's physical presence is intentionally pared down, the app is an important part of how the device functions. With it, you can see what song you're currently listening to, and you can star it to add it to a master playlist on your Rdio profile. Here's where you can also control Cone's basic functionality from afar, too, including volume and pause. Through Cone's app, you can access any playlist you've made on Rdio and search for specific tunes on Rdio from the app—essential functionality if you're requesting something obscure or difficult to pronounce. One nice feature of the app is its recall, which lets you see a list of songs Cone has recently played. If you notice a song you like and forget to star it, you can always scroll up to check out the name. Right now, the app is still fairly glitchy—but since it's still in beta, odds are good functionality will be smoother by the time Cone ships in late June. Design writers tend to overuse the word beautiful. But this is a beautiful device. Just playing around with its physical interface was a joy. I'm willing to wager that Cone will eventually become a classic piece of product design. Every detail—from the weighting to the detailing on the copper cap—feels thoughtful and precise without veering into pretentiousness. Cone's sound quality is on par with much larger speakers, with deep, crisp bass and smooth, mild treble. I was constantly turning it up just to enjoy how much better songs sounded on this tiny speaker than on my giant desktop computer or puny wireless speaker. Any audiophiles worried that Cone's designers spent too much time on software and not enough on sound quality will be pleasantly surprised. The battery life is also excellent, with eight hours of play before you have to plug it back in to charge. Though the Cone app's suggestions weren't always exactly what I had in mind, it did make good on the promise of introducing me to new bands and songs. And even when I was yelling my requests at it, it was hard not to like it. This little guy has charisma. Since Aether's software is still very much a work in progress, that's an important attribute for Cone to have. The parable of Cone is this: Be careful who you partner with. The entire month I used the speaker, I wondered how much better it would be if it linked with my Spotify account rather than Rdio, which I hadn't used before. Without a library of playlists and favorites to go off of, I had to rebuild a rough facsimile of my musical tastes in Rdio by requesting songs and artists through Cone, then favoriting them on the Cone app. This was anything but simple. In fact, it felt like twice the work. When I let Cone pick the tunes for me, things got more interesting. If I had to describe how Cone seemed to think of me using demographic cliches, I would say "Millennial pop fan edging towards corporate indie." It showed a real tendency towards the Decemberists and Foster the People, which seemed odd given that I'd never requested either band. Washed Out's Feel It All Around You (better known as Portlandia's theme song) is probably my Cone's favorite song of all time; it came on practically every day. Cone did seem to learn that I liked certain artists, but not all of them: Out of every dozen or so requests, it only repeated a few of them. Particular pieces of classic music were really difficult to request, too. The central button is Cone's only major flaw when it comes to industrial design. Because you use it to both pause and request songs, it can get confusing. Requesting a song takes a fairly substantial push, and anything less can accidentally pause what's already playing. Cone's voice recognition is generally good, but it suffers in the same way that every other device with voice control does: It gets unusual names wrong every now and then. That wouldn't be such a huge problem, but it can be hard to tell whether Cone just didn't understand you or whether Rdio just doesn't have the artist you're looking for. Once again, a function that was supposed to simplify life was just adding another layer of complexity. It was back to the app to attempt to search for the song I wanted in Rdio. By the end of the month, I found myself furtively using Cone's back-up plan—Airplay compatibility—more and more in order to avoid Rdio. The experience for existing Rdio users is almost certainly much more satisfying. This week, Lamb told me that Aether is in talks with "multiple streaming services right now to accelerate that goal," which also sounds promising. By designing Cone, the team at Aether basically took on a challenge that's been unsolved by two generations of scientists and engineers studying machine learning: The conundrum of whether a machine can truly learn to act like a human. This is an idea that goes all the way back to Alan Turing, whose eponymous Turing Test sought to find a machine that could imitate humans well enough to fool an actual human. Did Cone pass its proverbial Turing Test? Not for me: the difference between music I'd chosen and music Cone suggested was always clear. It's going to take a few more iterations before it will really feel like it's "thinking" rather than "guessing." But Aether seems to know that its first product is still a work in progress. Back in March, Lamb described his speaker to me as a piece of hardware that's designed to grow along with the software. It's a beautiful shell for a piece of programming that's still being developed. If you're willing to take a leap of faith—and are steeped in Rdio already—I'd highly recommend buying a Cone and joining the Aether team on their journey into the future of machine learning. If you're not interested in participating in an experiment like that—for $400, no less!—this isn't the speaker for you. Either way, it's been a long time since we've seen this kind of experimentation in consumer electronics. With Apple pulling back from introducing new products to focus on, well, other companies, and other tech giants focusing on refining existing product categories, it's exciting to see a company like Aether thinking so far into the future. Even if that future isn't quite here yet.